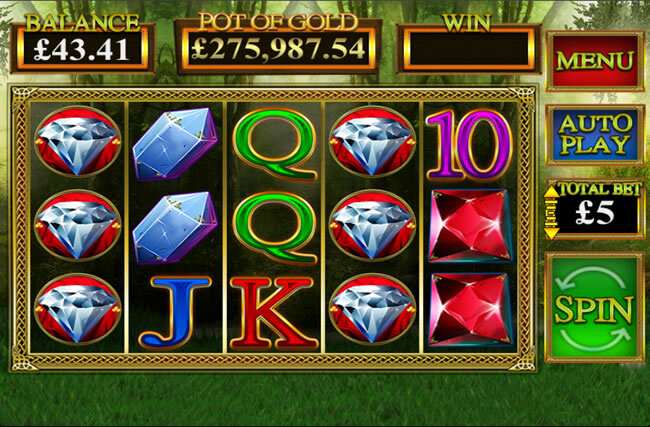 Gold Leaf Clover is a slot machine game with a stunning mystical Irish theme. Get a win for matching 3 or more symbols on a payline, with all wins paying adjacent. When a Golden Charm symbol appears in view a symbol is revealed at random for more chances to win big! Utilising a similar interface to other classic-style Blueprint Gaming mobile games like Super Diamond Deluxe, this slot is played out over 5 reels and 10 fixed paylines, with fairly basic symbols in play. Across the reels we get rubies, emeralds, diamonds and jewels, plus some standard 10-through-to-Ace symbols. If you hit the Shamrock spinning symbol on the reels it will rotate – in fact, every Shamrock on the reels will spin at the same time - which stop to reveal a mystery symbol at random. It’s like having a Random Wild in play. This can lead to you getting lots of stacked winning combos everywhere, and if you’re lucky having an entire screen full of winning symbols. Do this and a 1000x jackpot can be yours. Play at the maximum limit and that equates to a $1,000,000 payout. Not only are there huge jackpots on offer, there’s also a Progressive Jackpot to be won. If you land Spinning Shamrocks and they become Pots of Gold you’ll bag yourself the big one. I am a big fan of progressive jackpots and even though I have never triggered one in my life it does me no harm in being attracted to the slots that give me a chance to win one. 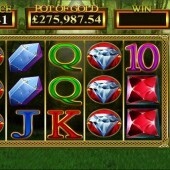 While the gameplay and reels are fairly basic at first glance, it’s the bonus symbols that really make this slot pay. I found myself getting some really huge wins when hitting the Spinning bonus symbols, and with only 10 paylines it doesn’t mean the slot is too bad on the variance front. Gold Leaf Clover is that weird beast – a mobile slot that doesn’t look much cop when you first play it but soon reveals some true delights. Just make sure you play it on a tablet – I tried in on a small Android screen and the graphics were terrible and the Spin button a little slow to react. Like this game? Try Leprechaun’s Luck, the craic-ing Celtic-themed slot from Ash Gaming, while Luck O’ the Irish, another Irish-themed mobile slot from Blueprint, is good for those who prefer a few bonus rounds on your slots.